Are you also seeing below error when trying to integrate Tomcat 8.5.x or TomEE 7.x using Tomcat v8.0 Server plugin in Eclipse? For searchbots, the error says The Apache Tomcat installation at this directory is version 8.5.3. 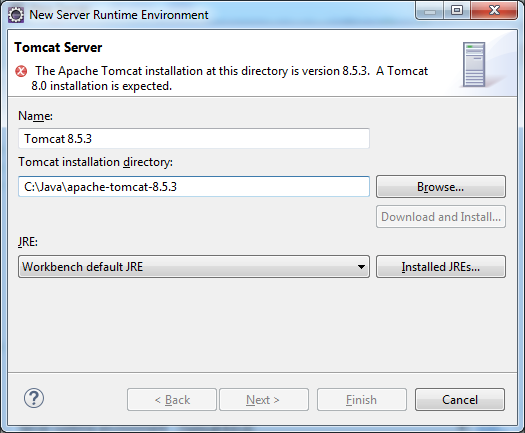 A Tomcat 8.0 installation is expected . This error even occurs in the current Eclipse Neon release. Perhaps they'll fix it in Neon SR1 by adding a new Tomcat v8.5 Server plugin. But for now and for older versions a workaround is needed. All we need to do is to edit the version in server.info property to start with 8.0. Any ZIP or JAR aware tool should do it to edit it on the fly. I'm myself using WinRAR for the job. The same procedure applies to TomEE 7.x which is based on Tomcat 8.5.x. The difference between Tomcat 8.0 and 8.5 is the integration of Jaspic which is the first step towards standardizing Java EE authentication as part of JSR375. You probably already know that the ways to configure Java EE container managed authentication are totally scattered across different servers, making third party libraries such as Shiro and Spring Security more attractive. Each server needed its own way of configuring "realms" or "identity stores" to manage the database of users, passwords and roles. This will with JSR375 be unified using annotations and CDI provided via standard javax.security. * API. See also a.o. the question Java EE authentication: how to capture login event? With Neon comes "Tomcat 9" as a drop down option for Targeted Runtimes. 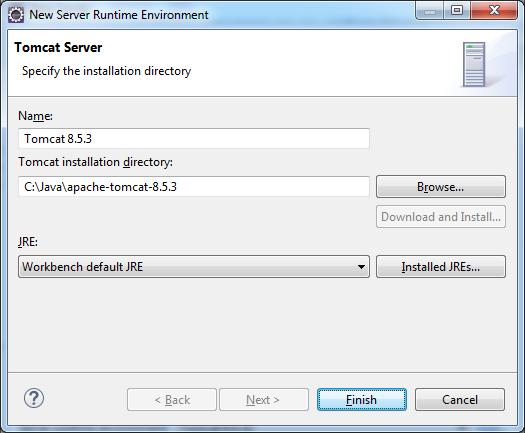 However, there is a problem in picking up the "servlet-api.jar" from the Tomcat 9 "lib" folder (e.g., D:\apache-tomcat-9.0.0.M9\lib where D:\apache-tomcat-9.0.0.M9 was given as the Tomcat installation directory while creating the server) and so javax.servlet. * does leads to compile errors. Selecting "servlet-api.jar" as an external jar or putting it in WEB-INF/lib works but is there a proper workaround?